Tiffany's Online Finds and Deals: Great price on TCL 55” Class 4K HDR Roku Smart LED TV! 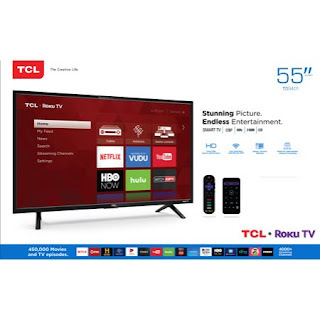 Great price on TCL 55” Class 4K HDR Roku Smart LED TV! Walmart currently has TCL 55” Class 4K (2160P) HDR Roku Smart LED TV (55S401) for ONLY $398 FREE store pick up. This is a great price if your looking for a new TV.